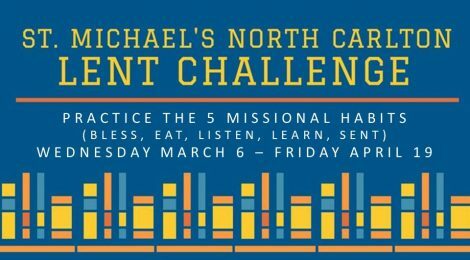 Welcome to the Lent Challenge! Lent is the period of 40 days leading up to Good Friday. In the past, many Christians have fasted during this period as a means of devotion and spiritual growth. Others have used the time to creatively focus on the significance of Jesus’ sacrifice of himself for the world. At St Michael’s we are challenging ourselves to practice the 5 missional habits as described in the table below. We encourage you to do this as part of a group (home group, family, etc.). At the end of each week (or so), we would love it if you would post your thoughts in the forum or by email to office@stmichaelsnc.org.au or drop a note in the Everything Box. LEARN Christlike I will read a chapter (or more) of the Bible each day. The books we are reading this Lent are Judges 1-21, Micah 1-7 and Hebrews 1-13.